The First Annual DC Guitar Holiday Party. I could find no other occasion more meritorious than the birth of a legend of rock, and a personal favorite of mine: Keith Richards. So we're doing it on his birthday. There will be live music with NO COVER CHARGE. As a benefit for Breast Cancer, I'll be raffling off about $1200 in FREE guitar lessons for the Holidays. 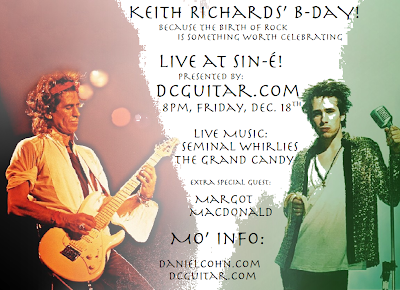 I figure Keith would like an event that saves at least half of the things he sings about here. And I know Keith's music has saved the other half of those things for many of us, many times. As for the live music, my current Jam Class band, The Seminal Whirlies, is going to open the show. In the spirit of lifetime musical growth, I play drums in this band. My students play guitar. I am pleased to be able to say that another one of my students, Ms.Margot MacDonald, will be dropping by after her gig at the Kennedy Center that night. At Sin-E, she'll be sitting in with some ladies and gents that call themselves The Grand Candy. The way I write songs is to sit down and play 25 great songs by other people and hope that one of mine drips off the end. Over the next week the list will be edited, and starting next Music Monday (Yo ho ho: #mm) the list will be whittled down to a manageable size via Twitter. Then come join me at my neighborhood bar for a fun evening on Friday the 18th.